As I mentioned in Part 1, I just hired someone to start listing all of that junk/"treasure" that has accumulated in my so-called eBay room. Teaching her how to "do" eBay from the ground up has been an interesting task, since I definitely have my own rhythm as to how I get things done in my online business. And over the years, I have automated so many of my business tasks that I don't think about them anymore. As promised in the last column, I want to show you one of my latest tricks for saving time: being more efficient in business through automation and getting Google to do some of your work for you! Google has an almost unlimited set of powerful business tools to help you run your online business. I have integrated Google Docs, Calendar and Local into my business. Google Analytics and Website Optimizer give me a huge inside edge, and Google Keyword Tool allows me to speak the language of the people who are looking to spend money. I recently started using Google's e-mail program, Gmail, as not just a personal e-mail address, but also as another business tool. I love Gmail, not just for its seemingly unlimited space and insane spam control, but for its ability to transform my e-mail into a profitable tool in my business. Send a copy of the e-mail to your assistant or shipping manager then archive the information. Set up Google alerts for your clients' products and have a report e-mailed to them once a day. Send copies of all "payments received" to your accountant and file them. And probably the best part? You don't have to put Google on the payroll for all the work it's about to do for you automatically! 1. Make a list. 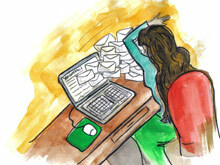 First think about how you want your e-mails grouped. This is similar to the process of putting together your files for a filing cabinet. What makes sense to you and how you do business? 2. Create labels. On the left side of the Gmail page, click the drop-down arrow and click "create a new label." Type in the name of your label and click "OK." Continue doing this for all of the file names you have come up with so far. 3. Organize with color-coding. Once you have completed your label list, color-code them. There is a white box to the left of the label. If you hover over it, an arrow will appear. Click that and a complete color choice box will appear for you to choose your color. Hint: I use the custom colors link to color-code similar labels together (i.e., all of my money related labels are coded with various shades of green). 4. Filter the information. Although color-coding will make viewing your e-mail so much easier—at a glance you can determine your next action—don't stop there. Now let's really put Google to work. At the top of Gmail, click the "label" drop-down tab and click the "Manage labels" link. Now click the "Filters" link on that page. Then scroll down and click "Create a new filter." Now it's time to do a bit of thinking. What is a common denominator in each of the e-mails you want to group together? Are they always from the same person or e-mail domain? Do they always have a certain word or words in them? Is the subject line always the same? You can fill in just one box or a couple of them to get the right results. You can always click the "Test Search" button to find out if you have narrowed down all the e-mails you want grouped together. You might put in Google Alerts in the "From" box and the words "Mermaid Caramels" in the "Has the Words" box. This would pull all e-mails that are Google Alerts about one of my other companies, Mermaid Caramels together. 5. Tell it where to go. Now what do you want Google to do with each and every one of these e-mails that come through? Apply the label/Choose label—pick one of the labels you have already created and assign it to this group of e-mails. For Google Alerts on Mermaid Caramels, I assign it the label of Alert-Mermaid. Forward it to/e-mail address—perhaps one of your labels is for sold items on eBay. You can include the e-mail address of your shipping person in this box. Anytime something is sold, Gmail will automatically send a copy to your shipping department. Click the "create filter" button and you are set! You can choose more than one action to get things done. I have a Google Alert set up for my client Jean. That Google Alert is set to come into my Gmail inbox once a day. When Gmail sees it come in, it color codes it with two labels (Google Alert and Alert-Jean), files it under those labels and sends a copy of the Google Alerts to my client's assistant. I look super organized and on top of the online activities to my client, yet Google did all the work, and I don't owe it a dime! Are you fully optimizing the tools that are available to you? By automating your business, you are freeing up time to do the things an owner should do in a business, and not be a worker bee.